A feature that returns to the FIFA series for a second time after its debut in FIFA 09 is the ability to control the celebration of your player after he has scored. There are two types of celebration moves; running moves and finishing moves. Find out your favorite combinations and celebrate your great goals with a traditional punch the air or a more fancy salsa dance. It is more than easy easy to be mesmerized by the awesome FIFA 11 skill move combos you see done on YouTube videos or even against other players online. 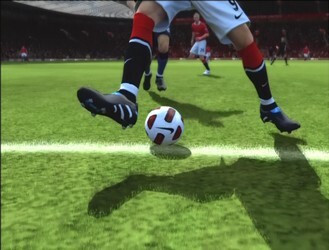 Many players, particularly newer ones, often want to add some trickery and flair to their game with skill moves, but don't know where to start. Although it may seem okay to just jam the trick stick in every direction, it is more effective to approach this with a systematic method. Below is a table of all the basic controls in FIFA 11. Although you will probably be familiar with the vast majority of these, it is a good idea to skim over this as you might learn something you didn't know before. Its the little things like knowing how to execute an early cross or initiate runs that make big differences in matches, so take a quick look!